FILE PHOTO Wilmorite wants to develop an idle property on Pittsford's Schoen Place into a hotel, spa, restaurant, and commercial space. [UPDATED AND REVISED 09/06/17] Wilmorite's plan to develop the last gap in the Village of Pittsford's treasured Schoen Place waterfront district was destined to cause some friction from the get-go. The property currently contrasts its surroundings. Schoen Place is lined with old barns, warehouses, mills, and even a silo that have been carefully restored and converted into shops, restaurants, a brewery, and some offices. 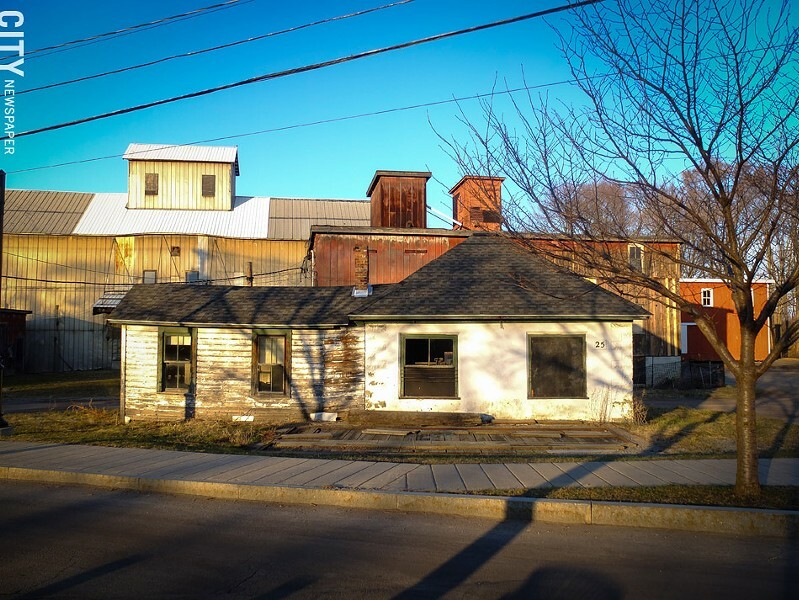 But 25 Schoen Place is a bunch of weathered, tired barns – all but one, which is used by a screen printing business, have been idle since the late 1990's – and a small, white office building. Wilmorite wants to buy the property, along with a few adjoining acres, from members of the Powers family, who are well-known Pittsford farmers. It proposes using the site for a 90-room, three-level boutique hotel, spa, and restaurant, as well as mixed-use office and retail space. 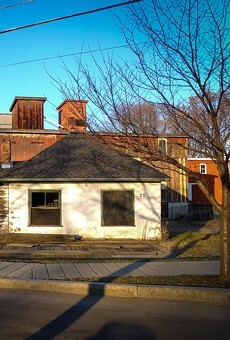 The Village of Pittsford is well known for preservation. And that focus is evident in its busy but compact downtown; in its old, well-cared-for houses, and along the Erie Canal at Schoen Place. The village didn't get where it is by being lenient with businesses or builders, big and small. On occasion, village officials and volunteer review board members have gone toe-to-toe with developers whose plans they feel haven't meshed with the village's character. And now there's something of a cold war building between the village and Wilmorite officials. Pittsford officials, particularly Mayor Bob Corby, have been adamant that the project needs to match the character of Schoen Place. Corby has also said village officials want the developer to preserve and rehabilitate the existing buildings. Village trustees recently proposed a development moratorium, a move that's earned the Wilmorite's ire. Corby and the trustees want to review and revamp the village's zoning code and update its comprehensive plan, which underpins village policies on planning and development. Corby insists that the moratorium proposal has nothing to do with the Schoen Place proposal. He's says he's staying out of board discussions and decisions on the project because his aunt and her husband own the 25 Schoen Place property and he wants to avoid even the hint of a conflict of interest. But Wilmorite executives aren't buying the village's explanation for the moratorium. They suspect that officials are, indeed, targeting their project, says Dennis Wilmot, the company's senior vice president of leasing and development. "This moratorium came as a surprise to most of us," he says. And, he adds, "we thought the timing of the moratorium was a little peculiar, given how quickly they were trying to put it in place." The trustees held a public hearing on the moratorium last month, and the board tabled the issue until its September 12 meeting. The village faced some big development and planning issues even before the Wilmorite proposal. A judge is working his way through a tangle of lawsuits around a hyper-contentious apartment complex project on Monroe Avenue, right at the village edge. The project is at a standstill for the time being. The village also owns 12 acres of canal-side land in its northwest corner, and Pittsford officials have been mulling what to do with it. "We had no knowledge of Wilmorite's project when we began planning for the comprehensive plan update, and this happened long before we knew anything about what the plans were for Schoen Place," Corby says. "It really doesn't have much to do with that." Pittsford's zoning laws – the fundamental tool officials use to guard the village's character – were written in 1956. The codes have been amended piece by piece over the years, but officials haven't done a bottom-up review of them. That should have happened after the 2002 comprehensive plan was finished, but officials had to devote their attention to development proposals and village initiatives, so the work never took place, Corby says. The codes now have some obvious flaws, he says. In various places, they refer to obsolete state laws, use differing terms for the same permits, and use ambiguous language, he says. They also don't clearly state the village's existing design and preservation standards, nor do they adequately reflect a key Pittsford priority: making the village more walkable and less car focused. Corby and the trustees want to review and revamp the zoning codes to address many of those problems, and at the same time they want to update the village's 15-year-old comprehensive plan. But to effectively move forward without creating conflicts and confusion, the village board needs to temporarily halt development project reviews, Corby says. The trustees are still settling the specifics of the potential moratorium, including its length and scope, the mayor says. The tabled proposals called for a year-long pause with a possible six-month extension. Moratoriums are a common planning tool used by local governments. A volunteer committee would lead the comprehensive plan update, and the village would hire planning and architectural consultants to help with the process. That plan will likely generate some zoning-law changes for the village to follow up on, though the changes probably wouldn't be part of the immediate code revisions, Corby says. The 2002 plan laid out a vision for Pittsford as a compact, preservation-minded community that emphasizes pedestrians over cars. The updated plan will build on that vision. Walkable streets are essential for residents' quality of life and the economic success of Pittsford's downtown, Corby says. Traffic-calming approaches will figure into the plan, and the active transportation plan that the town and village are jointly developing would get folded into it, Corby says. The comprehensive plan would also lay out a strategy for the village's center that considers the evolving nature of the retail industry, Corby says. Retail is a traditional staple of the village's core. "We want to make sure that this is a permanent change," Corby says. "We think we have a good handle on the direction that the village is going." Wilmorite executives worry about any delay in their proposed project, and they see a year- to 18-month-long moratorium as excessive, Wilmot says. The company is also worried that changes to the comprehensive plan could prove problematic for their proposal. Wilmorite representatives reached out to village officials to discuss the project before formally submitting it for review, Wilmot says. "We're not coming in and saying everything is set, it has to be this way or no way," Wilmot says. "We've since Day 1 tried to have an open dialogue, and the mayor and the trustees have just not been willing to do that, which has been very frustrating for us." The village has, however, set up a design review committee to work with Wilmorite on the project. Wilmot says the company's first meeting with the committee is set for September 8. The company has received support for its proposal from village businesses and residents, Wilmot says. A group calling itself Friends of Schoen Place, however, has set up a Save Schoen Place page on Facebook and a website, saveschoenplace.com, that lay out arguments against the project. Chiefly, the Friends group argues that the Wilmorite project is too big, is inconsistent with the village character, and would generate unwanted traffic. Wilmorite ultimately wants the village board to scrap its plans for a development moratorium so the project can proceed through review. "I think if the moratorium proceeds, we're going to have to step back and make a decisions as to whether or not we will continue to pursue this project," Wilmot says. An earlier version of this article incorrectly Dennis Wilmot, Wilmorite's senior vice president of leasing and development, as Kevin Wilmot.